Feminized Marijuana seeds have been growing in popularity slowly but steadily over the past few years. In Europe 90% of the growers use feminized seeds. In the USA this number is lower but feminized seeds have been rapidly gaining traction there in the past few years, and for a good reson. As any marijuana grower should know, only the female plant is suitable for the production of marijuana. Unfertilized female marijuana plants will consistently produce higher amounts of THC. These unfertilized female plants make the best marijuana for consumption. Male plants produce pollen which are useless for a marijuana grower. Breeders however use male pollen to create regular marijuana seeds. They use the strongest male plants to fertilize the strongest female's so they can produce seeds with strong genetics. when a female marijuana plant is fertilized by male pollen it will produce seeds and a much lower percentage of THC. When you grow regular seeds you will get around 50% female and around 50% male plants. For marijuana growers it is important to keep the male plants away from their female plants to make sure the females do not get fertalized and optimise the THC production. Most growers will simply destroy the male plants as they have no use for them. Needless to say this is a time consuming and costly operation that has many downsides, especially for indoor growers (who want to optimize the use of availabe space) but also for outdoor (guerilla) growers. So what are your options when ordering seeds? Many vendors claim their seeds have a "high female ratio." What does this mean, really? They mean their breeds have few male plants produced in seeding. This is very desirable, but not the optimal choice. Modern technology has allowed for better than "high female ratio." Now growers can have access to feminized marijuana seeds, the best alternative all around! Only the female plants have the necessary chemicals which produce the iconic marijuana high, so a mixture of male and female plants is just a waste of time. THC, the common usage for the hallucinogenic Tetrahydrocannabinol, is one of the oldest known hallucinogenic compounds around. The best marijuana crops have more female plants and thus more resinous buds which have a higher THC content overall. This is a desired trait by both growers and users, especially medicinal users who grow their own plant(s). Breeders can selectively engineer breeds of marijuana plants without male chromosomes, guaranteeing the plants produced will be female. This means ALL your seeds will produce female plants! Most marijuana growers start their crops from seeds. It is possible to begin crops from a single female plant (the mother) and take cuttings which can be grown to produce other female plants (clones). This is a technique which is more popular in North America and the Netherlands, but elsewhere, it is more common to grow crops from seeds. Feminized marijuana seeds produce only female plants, and they have been growing in popularity all over the world. They are now sold in shops and online. There are many advantages to growing feminized seeds over regular seeds, and the benefit is gained more by casual and commercial growers than by breeders. With all female plants, you cannot have the buds being pollinated by male plants, which will allow them to keep growing and building up more THC. That is the main secret! Because there cannot be male plants produced, the plants grown will be female and have the more sought after buds and flowers. 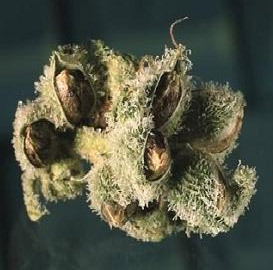 Some few feminized seeds produce hermaphrodites under extreme conditions. This is determined by the stability of the strain as grown by the breeders, by lighting (which needs to be regular and cyclic) and feeding conditions. Almost as undesirable as male plants, which are useless, the hermaphrodites will pollinate themselves and many of the nearby plants. This will reduce the THC buildup in the pollinated plants, but even this downside has its own upside: the seeds produced are always 100% female. Hybrids produced using those strains will have a tendency to pass on hermaphroditism. When searching for a vendor for the sought after feminized marijuana seeds, look to make sure the word "feminized" is included in the plant description, usually before or after the breed name, like: Aurora Indica feminized. while the legalization process of cannabis has been gaining strength, and it is legal to use and grow small quantities for personal use in many locations, this is not the case everywhere. Internationally, it is still illegal to import marijuana seeds in many locations. Please exercise responsibility and consult your local laws and regulations regarding marijuana.